Those who've yet to be swept off their feet by charming comedienne Lake Bell (writer-director-star of the hilarious In a World...) should make Man Up a must - a film where she makes even the screenplay's limper lines snap, crackle and pop, papering over the sometimes cringing machinations by delivering a performance of likeability and integrity. Nailing an English accent (whilst managing not to sound like a member of the royal family, as so many American actresses do), Bell plays journalist Nancy, a cynical 34-year-old Londoner who accidentally steals someone else's blind date and ends up falling for him. 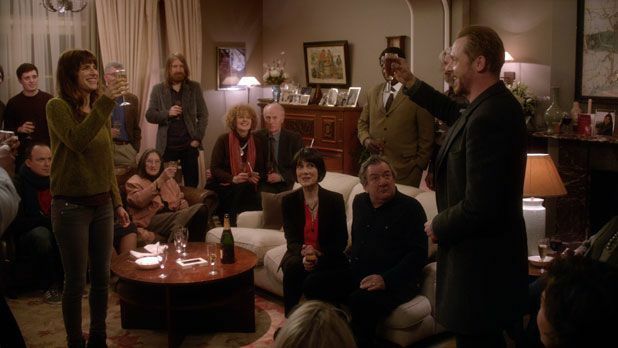 The feller in question is Jack (Simon Pegg) and the date comprises a catalogue of disasters, from sexual harassment to a blaze in a bar, as Nancy tries to extract herself to attend her besotted parents' anniversary party. The zingy script (courtesy of screenwriter Tess Morris) and endearingly awkward pair make this lean appealingly toward screwball, while both leads are equipped with the comic chops to make the dialogue fly fast and funny. This is Pegg's most engaging, least irritating work for a long time; sadly, it's poorly plotted and periodically crude, with an embarrassing, choreographed dance scene and a double-date with Jack's unpleasant ex (Olivia Williams) representing a couple of contrivances too many. And Rory Kinnear might give it his all but his performance as Nancy's stalker Sean, who does his best to get in the way of true love, frequently grates. The cast is nicely filled out by Sharon Horgan, Ophelia Lovibond and Ken Stott, while director Ben Palmer (The Inbetweeners Movie) helms with energy and perhaps an overabundance of confidence. Man Up doesn't differentiate itself from the dregs of the genre as much as it might seek to but, in Bell's most modern of rom-com heroines, we've finally found a woman with whom many will chime. General release from Fri 29 May. Cynical thirtysomething journalist Nancy (Bell, nailing an English accent) accidentally steals someone else's blind date, Jack (Pegg) and ends up falling for him. Although it's poorly-plotted and sometimes crude, the very likeable Bell makes the dialogue crackle and Pegg is more engaging than he's been in a long time.